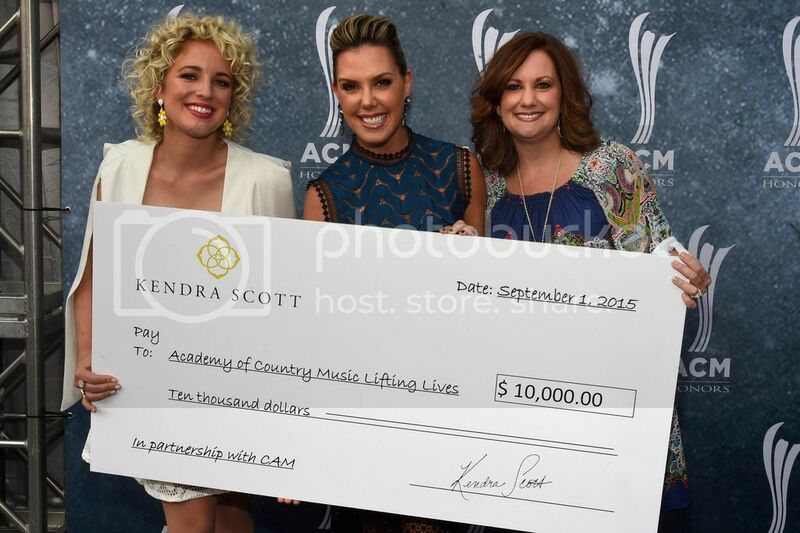 NASHVILLE, TN (September 2, 2015) –– Renowned designer, CEO and philanthropist Kendra Scott made a $10,000 donation to ACM® Lifting Lives® on the ACM Honors™ red carpet last night in Nashville, TN, presenting the check with country artist Cam to Lori Badgett, President of ACM Lifting Lives. Scott recently opened her 28th retail location in the Hill Center in Nashville, and is celebrating her Nashville store with an exclusive, invite only event while she’s in town. Kendra Scott started her jewelry company in 2002, with only $500 just three months after her first son was born. She went door to door to area boutiques armed with only a tea box full of her jewelry to present her designs. Kendra wowed potential customers with her infectious personality and unique eye for design. The foundation of Kendra's success has been her innate ability to utilize natural stones and custom designed shapes, which has brought her from a small start-up to a multi-million dollar business loved globally. Kendra has created collections of timeless pieces that have won over loyal fans, media and celebrities, like Cam, alike. Today, the company continues to design and operate out of Austin, TX with a focus on family, fashion & philanthropy. In the past 12 months, the company donated $1 million dollars and 50,000 pieces of jewelry while working with over 1,000 local and national organizations.